Blackberries are a healthy snack or dessert, but if you experience diarrhea after eating them, blackberries might not be a good food choice for you. Diarrhea can occur for several reasons after you eat blackberries. The most common causes of diarrhea from blackberries include salicylate sensitivity, food allergy and food poisoning. Salicylates are a chemical that is naturally found in various fruits and vegetables. The chemical has similarities with aspirin and can trigger symptoms of aspirin sensitivity. Salicylate sensitivity occurs when your body is unable to process the amount of salicylates you eat in one sitting. Blackberries contain higher levels of salicylates, which can trigger common symptoms including asthma, sinus inflammation, skin rashes and digestive complications, according to the Auckland Allergy Clinic. This condition is treated by avoiding all foods and medications that contain salicylates. A food allergy to blackberries can cause diarrhea to develop shortly after eating blackberries. Blackberries contain proteins that your immune system may recognize as dangerous, although they're safe for human consumption. When this mistake occurs, your body reacts by creating immunoglobulin E antibodies and histamine to fight against the blackberry proteins. This causes inflammation in the intestines, leading to stomach pain, cramping, diarrhea, nausea and vomiting. Food allergies can lead to a severe allergic reaction called anaphylaxis, which could be life-threatening. Seek immediate medical attention if you experience shortness of breath or difficulty breathing along with gastrointestinal symptoms after eating blackberries. Whenever you develop diarrhea and vomiting after eating a certain food, food poisoning is a possiblity. Food poisoning can occur in any food, but is more common in fresh meats, fruits and vegetables. This acute digestive condition is caused by infectious organisms found in the food. 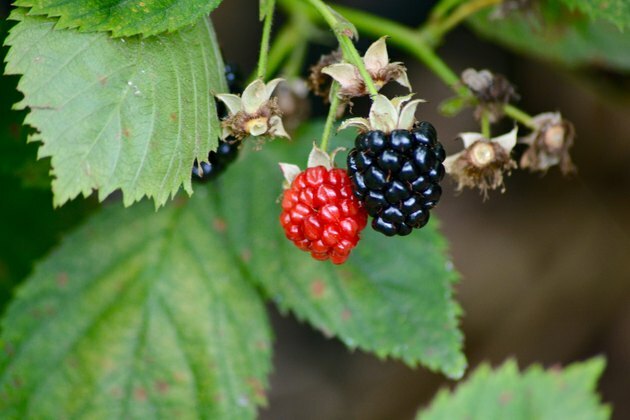 If you have food poisoning from eating blackberries, you will develop diarrhea, vomiting and nausea within a few hours to one day after consuming the contaminated blackberries. The only treatment for food poisoning is a modified diet that consists of bland foods, drinking more fluids and getting rest. It's uncommon for food poisoning to cause any long-term effects. Diarrhea is not a condition, but rather a symptom of a condition. Excessive diarrhea is not considered normal and needs to be evaluated by your doctor if it persists for more than three days. The presence of blood in your stool or vomit is a concerning symptom. Call your doctor immediately if you notice blood in your stool.